IBM Proprinter III dot matrix printer. 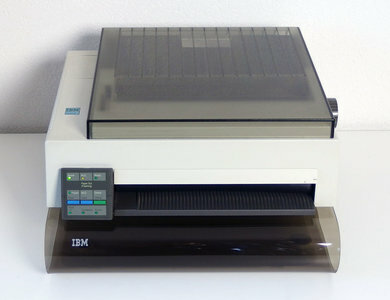 The IBM Proprinter III is a compact and relatively light weight dot matrix printer, designed for use with the IBM PS/2 series of personal computer. This printer can only print on continuous feed paper with its tractor unit. The printer has a standard centronics interface. New ink ribbons are still available. Includes noise / dust cover and the continuous feed paper desk holder. This printer was last tested at 10 February 2019. - Printer could be powered on several times. - Paper feed motor of the printer worked fine.